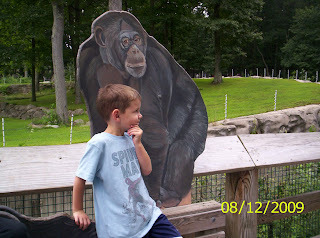 ...but how many years he'll be in therapy because we posed him for these pics. Heh. 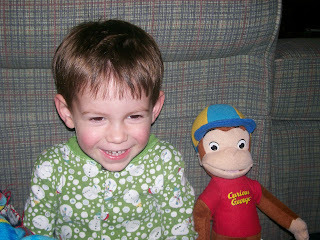 I love the picture with Curious George. So cute! Just wait until his high school graduation party... you can post these all over the place for his friends to see. So beautiful!! Thanks for sharing your handsome fellas. LOL! Those are just too cute. He's going to remember this when he chooses your retirement home. He could not be cuter! He's adorable. 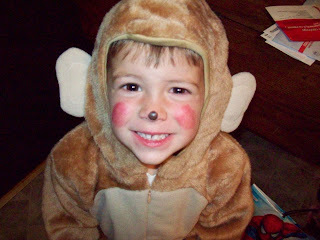 My youngest is my Spunky Monkey too...we have tons of pictures with her and monkeys. We even went to the zoo today...and, of course, got another picture of her near the monkeys. look how little he was honey!! sooo sweet!